This book is 233 pages long. If you were to remove everything unrelated to the ivory Vikings or the woman who made them, I doubt whether this book would even be ten or twenty pages long. Don't get me wrong, that ten to twenty pages would be really fascinating! But this kind of writing really irritates me: If you don't have enough content to fill a book, just don't write one. 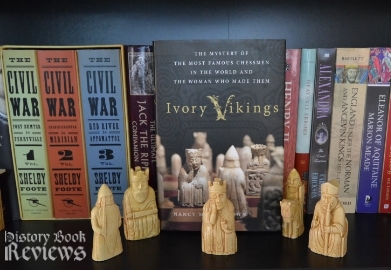 Ivory Vikings is supposed to be about the Lewis Chessmen, a group of late-Viking Age chess pieces carved from ivory, found in the 19th century on the Isle of Lewis, Scotland. These figures have inspired humanity for over a century since their discovery, finding their way into popular art and culture, even making a guest appearance in the Harry Potter movies (and Lion in Winter, for those of you who love older movies, like I do!). There is a great deal of mystery as to who carved the chessmen, where they came from, exactly how old they are, and how they were made. Numerous studies have subjected them to scientific testing and visual/historical analysis, and they have been copied for replica sets (I have one myself!). The chess pieces are amazing, something truly special and unique: Beautiful, funny, old, and deeply evocative of the past, more so than most artifacts. The chess pieces are well deserving of tribute, but unfortunately this book does not meet the grade. My biggest problem with Ivory Vikings is that it did not have a narrative at all. The writing was almost poetic, very descriptive and artsy, and I was afraid it would not be very historical from the very beginning. I suspect that Brown did this on purpose to mirror the Icelandic Sagas, because the Sagas made up nearly the entire content of this book. 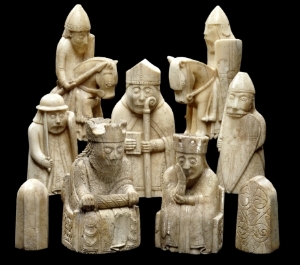 The author's argument is that the Lewis Chessmen were made in Iceland by a female carver named Margret the Adroit. I actually support her theory and find it very believable--it's just that all the evidence to support the theory could fit in a much, much smaller book. The remaining 200+ pages are basically filled with a retelling of the literary Sagas and Icelandic myths, and have almost nothing to do with the chessmen or Margret the Adroit. Pages and pages are spent describing walruses just for a background on ivory. The book delves into Viking history, Charlemagne's temper tantrums, and the particulars of medieval Icelandic church life. Apparently it was trendy in medieval Iceland to show penitence or asceticism by walking barefoot in the snow, and all the cool kids were doing it. What this had to do with the chessmen I cannot imagine. My other frustration with this book was in the organization. The chapters were broken up into the different chess figures: Rooks, Queens, Kings, etc. But they barely mentioned the actual chess pieces at all, or any of the scientific studies done on them. Everything was so unrelated and disconnected that it took me almost 100 pages to realize that the chess piece titles were meant as representative of that branch of society in medieval Iceland (i.e. the Bishop chapter focused a lot on religion in that time period). Or...at least I THINK that's what Brown was going for. The Queen chapter started off about queens but then discussed carvings, churchmen, and more unrelated myths. There was a section called 'Trondheim Queen' in the King chapter, as well as a section about knights...but why not just wait for that until the Knight chapter? It really made no sense at all. Have you ever heard someone say your name in a dark room when you thought you were alone? When your hair stands up on end, your heart races, your attention suddenly focuses like a hawk on a mouse, and you go from lazy sleepiness to acute alertness and awareness? That was the feeling I got during this book when Brown actually transitioned from hazy, disconnected background filler to actual information and investigative theory. It was a very noticeable change. Her discussion on the actual Lewis chessmen was great, her analyses and descriptions of how they may have been made were exciting, and I felt like I was actually reading a history book (though I do have to mention that this part was inexplicably placed at the end of the Queen chapter). I was thrilled to see Caroline Wilkinson pop up, who is basically the world's leading expert on forensic facial reconstruction, and a personal hero of mine. She led a study of the chessmen's faces to determine how many different hands and styles may have gone into making them, and this part of the book was enthralling. Unfortunately, this type of substance relating to the book's topic is very rare and all the rest is literary filler. Brown obviously loves Iceland and does justice to medieval Iceland's history and culture through exploration of their myths and Sagas, though in my opinion the lack of clear narrative made even this seem disjointed and almost boring. Ultimately I think you could get more and better information on the Lewis chessmen and Margret the Adroit on Wikipedia than in Ivory Vikings.